Why should we consider protecting ourself and our children from Microwave, Magnetic and Electrical Radiation exposure? What’s the deal? Basically, when the body it at rest during the night, this is the time when it carries out all of its’ repair (healing) work. However, when the body is exposed to magnetic, electrical, or especially, microwave radiation from all things wireless – DECT phones, WiFi, WiMAX, Bluetooth, Mobile Phones, Masts, Wireless Hubs/Routers and the like – the body, on a biophysical (energy) level, has to produce the ‘counter oscillations’ (mirror-image) of the frequencies it is being bombarded with. This, in simple terms, means that the body is constantly having to expend valuable energy neutralising these frequencies. When this happens, energy that could otherwise be used in the body’s natural repair process – homeostasis – is completely wasted elsewhere. This means that essential repair and healing processes may not be carried out by the body, or carried out fully. Thus, leaving the natural and protective process of homeostasis compromised. Over time, this means that something has to eventually give! In this case, what ‘gives’, is the biophysical and biological health of the body, because the normal repair and healing processes of the body have become compromised. If this exposure is not reduced or stopped, then eventually this may lead to what we know as illness and disease. Read more about the real dangers of EMF/EMR/Microwave Radiation that the government and telecommunications companies are just not telling us! Why? Money of course? Digital TV Switch Over – A Health Hazard Waiting To Happen? We can clearly see from the above examples how the digital signal is linear and ‘boxed’ compared with the natural undulation and flow of older analogue signals. It is this unnatural pulse-modulation (or ‘energy/information’) that the body responds to in a detrimental way on a biophysical level – see explanation above. It is therefore prudent that we protect our self and our children from this form of ‘radiation’ if we truly value their and our own health. Some people in Germany and now in the US where full Digital Switch Over has taken place, have been showing, and are beginning to show, signs of ill health and neurological compromise. Here is a list of operating frequencies above older digital communications – existing and proposed. All of the above are digitally pulsed, and for this reason are considered of special biological relevance by concerned physicians and scientists. This is our most popular shielding solution. 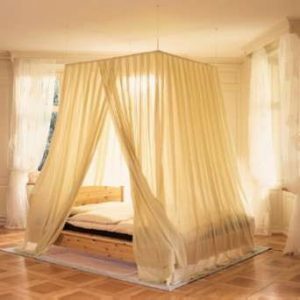 Used here in a bed canopy, our leading curtain material (with non-conductive surfaces) is “NEW DAYLITE” by Swiss Shield® – a 100% Tergal® polyester net-knit, with 5%-6% silver-plated copper fibre content which stops over 99% (20dB) of incoming microwave radiation energy (300 MHz – 6.0+ GHz) a range that encompasses all three mobile/cellular phone bands (including 3G/4G (UMTS-FDD), TETRA/Airwave, along with WiFi, WiMax, and Bluetooth). Sold by the running metre and is 2.5m (2.7 yards) wide. Pictured here in use as a bed canopy, this is our “Rolls Royce” shielding solution by Swiss Shield® – made of ’Ecological Cotton’ eco test certified for baby underwear but most popular as décor curtains. It stops over 99.9% (40dB) of incoming microwave radiation energy (300 MHz – 6.0+ GHz) a range that encompasses all three mobile/cellular phone bands (including GSM, 3G/4G (UMTS-FDD), TETRA/Airwave, along with WiFi, WiMax, and Bluetooth). OUT OF STOCK! Shown here as bedroom curtains, these are made from Swiss Shield® “Evolution”, fine woven white polyester, width 2.5 metres (2.7 yards), sold by the running metre – it also features a hidden lead band along one edge so that it hangs beautifully as a curtain. Most importantly, it stops over 99.9% (30dB) of incoming microwave radiation energy (300 MHz – 6.0+ GHz) a range that encompasses all three mobile/cellular phone bands (including GSM, 3G/UMTS-FDD), TETRA/Airwave, along with WiFi, WiMax, and Bluetooth). Looks and feels like normal cloth material. High Quality Bed Canopy for large-scale screening of high-frequency electromagnetic (microwave) waves and all things wireless. Attenuation 25 dB (99.7% shielding effectiveness) at 1 GHz. Width: 220 cm, length: 220 cm, height: 220 cm. Entry: Easy entry through two overlapping openings. 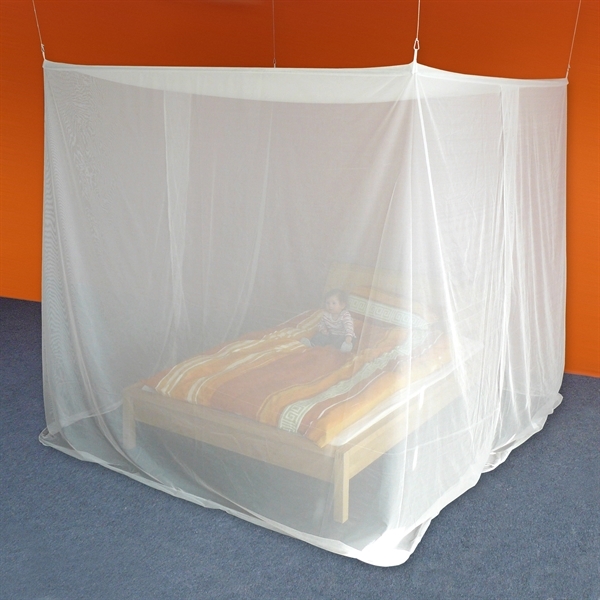 In order to achieve a complete Faraday cage, the bed should additionally be shielded from below. Comes complete with rods and all fixing materials. Made to order so may take up to 10 days or more for delivery! Easy to wash and iron – wash 30c, iron on Synthetic setting. It is colourfast and anti-static. Important: This material reflects high-frequency electromagnetic waves. As this canopy acts as a Faraday Cage, it is important that electronic devices are not used inside it. But then, why would they be used if we want to protect yourself and our children? SILVER TULLE is a semi transparent silvered fabric for the maximum protection against high and low frequency radiation (HF & LF). It is perfectly washproof and crease resistant! Regarding the spatial perception in combination with this material, the box-shaped canopy is of significant advantage! Box-shaped for double beds, colour: grey/silver. Entry: Easy entry through two openings overlapping by 50 cm. Can be Grounded for EXTRA protection (only necessary for low-frequency E-fields such as electrical and magnetic): Easily groundable – we recommend the use of our grounding components. All canopies come with grounding connections. For a full Faraday Cage, it is important to also shield your bed from below. We also recommend shielding the canopy from below, to achieve a complete Faraday cage. This floor mat is a sewed piece of shielding fabric that can be laid under the bed or under a carpet. It is made of the shielding fabric Steel Twin, which is a heavy and stable cotton fabric with stainless steel fibres woven onto the backside. The edges are sewn in. This floor mat consists of two elements and is appropriate for a double bed canopy. Width: 2×140 cm, length: 250 cm. Two elements placed next to each other are needed for double bed size. Attenuation 35 dB (99.97 % shielding effectiveness) at 1 GHz. The shielding power is effected by a wrapped stainless steel fiber. Material: 68 % Cotton, 16 % Polyester, 16 % Stainless steel. Colour: front side light gray, backside silver. The best EMR Protection ever? Let’s find out! How can EM Fields affect us adversely? The most significant method by which the body takes on increased voltage is from emitted electromagnetic radiation. Not only does this include using a Cell phone, Digital Cordless (DECT) phone, Wi-Fi, and other wireless devices close to the body, but also from more distant sources such as Cell Towers, Digital TV transmissions, Radar, etc. When exposed to this radiation the body, being a natural antenna (transmitter and receiver of ‘information/energy’), receives, and through its conductive tissues and fluids, converts electromagnetic waves into electric currents. Radiation from an electromagnetic source induces an alternating current in the body and a corresponding voltage. When the body is insulated from the Earth (i.e. wearing rubber-soled shoes), the body becomes a ‘sink’ for electromagnetic radiation. The body then absorbs this radiation, but cannot get rid of it. This radiation gets converted to electric currents which cause vibration at the cellular level. The modulated portion (data transmission) of this EM radiation is in a frequency range that causes harmful vibration at the cellular level. This then causes damage to the cell by displacing ions and destabilizing the membrane. Ultimately, this leads to membrane leakage and can produce negative biological effects. However, if the body is in direct contact with the Earth (i.e. Grounded), then the Earth becomes the ‘sink’ for the electromagnetic radiation. This means that the body functions as a conductor and allows the radiation to pass through it before current can be generated on a cellular level and cause damage. An absolute must for the frequent and not so frequent traveller, athlete and those people with muscle and joint aches and pains, and for those people who are electro-sensitive. When zipped up this unique Grounding Cocoon can be used just like a sleeping bag. It measures 2.3m x 1.1m and when you climb inside your whole body is grounded top to toe, front and back, side to side; all of which is connected with the earth to benefit from the Earth’s free electrons and natural biorhythms. Ideal for use at home for total body grounding, or for use when travelling. It feels like being back in the womb, the womb of Mother Earth! You feel so safe and secure, and in some way, totally nurtured. Bipolar Ionizers – Best Ionizers in the world. An absolute must for every household and office today! Creates Electrostatic Neutrality to our indoor environment. Essential for all electro-sensitive people. Additionally, and importantly, restores the Small Air Ions (SAI) found naturally in the fresh air of Nature to our indoor environment. In Nature we typically find around 1000 to 10000s of SAI per cubic cm, consisting of both positive and negative ions. However, in Homes & Offices this level of SAI drops to less than 30 per cubic cm, which is not healthy. In fact this poor air quality leads to ‘Chronic-Aero-Ionic-Starvation’, contributing to aging and various chronic diseases. Negative Ionizers (unipolar) cannot achieve this healthy balance or level of SAI that are required to create & maintain fresh living healthy ionized air – ionized air that we have naturally evolved with which is important to our health & well being. Air Ionization is as equally, if not more, important as Earthing / Grounding the Body is. Naturally increases the levels of Oxygen Ions too, which is very beneficial. Perfect for eliminating effects of EMFs. IMPORTANT NOTE: There are, albeit just, a few web sites on the Internet circulating information and so-called science that would indicate to the reader that grounding the body may be dangerous!! This is simply not true. Their reasoning, science and method of testing is deeply flawed, on many levels. The ‘science’ and ‘testing’ assumes as fact that the body is a volume conductor when nothing could be further from the truth! “Connecting the body to the earth essentially insulates the body from the influences of ambient electrical fields…Under these conditions, the body is maintained at the same electrical potential or voltage as the earth. Ambient fields cannot affect the potential on the body…Similarly, a body connected to the earth’s infinite supply of electrons will be at the same electrical potential…” Oschman, James L, 2008. In other words, the ‘field strength’ or ‘ambient field’ that the body is being subjected to would have to be able to change the entire field of the Earth before it could affect a change in the body. This is obviously impossible!